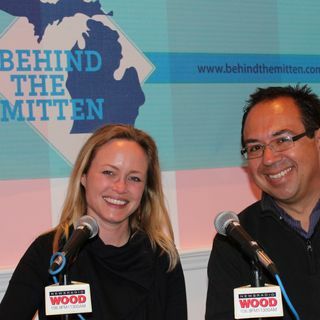 John Gonzalez and Amy Sherman of the weekend radio show "Behind the Mitten" visit with Justin Barclay of West Michigan Live on WOOD Radio (1300 AM and 106.9 FM). They talk about this weekend's show, which airs at 10 p.m. Saturday, April 21 on WOOD. On this weekend's show, John and Amy visit the Leelanau Wine Peninsula in Traverse City at Black Star Farms. They talk about upcoming events, such as Sips and Giggles, and May Wine Month in Michigan. Find awesome overnight ... Maggiori informazioni packages that include free wine tastings and more. Info at https://www.traversecity.com/. Also, learn more about Behind the Mitten at https://www.facebook.com/behindthemitten/.